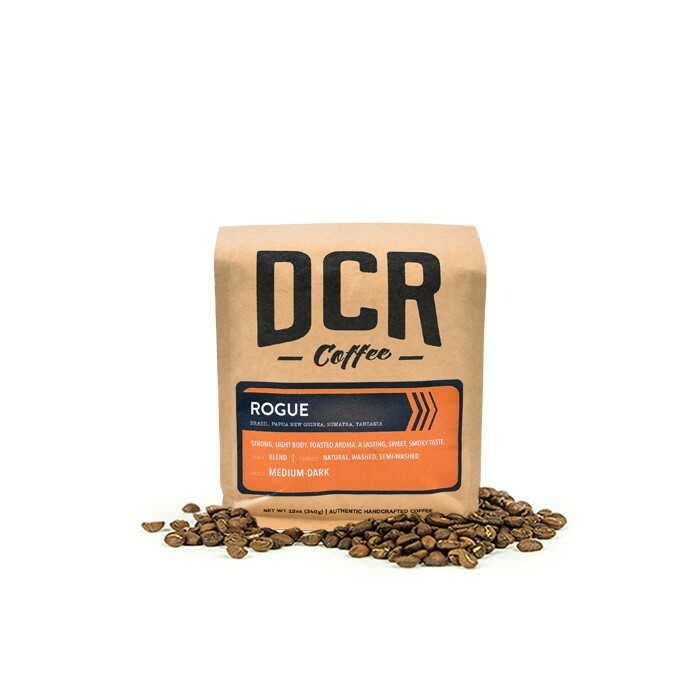 This is the Rogue brought to you by Dillanos Coffee Roasters. With seven coffees in this blend from Central and South America, Africa and Indonesia each cup is unique and enjoyable. This is a great example of how a stellar a fine tuned blend can be. This coffee is balanced with notes of caramel and chocolate notes. Oily and only fair. I'm not a fan of needing to wipe it out of the coffee grinder due to bean oil. Didn't really like this roast - it was too roasted and almost burnt tasking. Would it be possible to get a credit on this particular bag? New to good coffee and very impressed with this one. Finally enjoyed my coffee black. No bitterness. Maybe a little too smoky/burnt tasting. Not as good as the double dark blend. Very nice! Nutty and strong but not overly acidic. The aroma when grinding was oh-so-good! Sadly, the taste left something to be desired. Had to brew it a little stronger (more coffee per cup) than others, but overall a smooth taste. Brewed coffee aroma not quite as good as the raw ground roasted bean. This has been our favorite coffee to date. My husband, who isn't a coffee drinker said the same thing. It has the perfect hint of a caramel and chocolate that isn't overwhelming but adds a great flavor. Good flavor but I prefer a bit darker! Very good roast level. Strong flavor but not overpowering. Love it. Not as good as the Velo French or the Ddllano's Classic, but better than average. A little too smoky for me. Not much different than the previous dillano's blends. Balanced, and pretty decent. Smelled nice, but the flavor was a little mellow for my tastes. Definitely chocolate and caramel flavors were there, which I like. I think I like bolder darker flavors and coffees. Actually, I really enjoyed this. Deep, roasty, satisfying. I still think Colectivo Velo French is the best coffee in existence. This is maybe only the third or fourth best, but still deserves five stars. Enjoyed drinking it every morning. LOVE this flavor, acidity, and strength. This is my favorite. Although I'm a huge fan of chocolate and caramel, this roast was a little darker and richer than I hoped. Don't get me wrong, it is amazing, just not as light and I hoped! I really have been enjoying this coffee! I'm not a huge fan of "flavors" but the caramel and chocolate notes are just right. It's also made my house smell amazing! I wouldn't consider this a medium roast. It's pretty dark. So much so, that the oil has begun to seep from the beans. For a dark roast it's not bad. I'm getting notes of black current and tabbaco with a very full body. I don't like dark roasts, so this coffee is not my cup of tea. It came out a little bitter in my cup. Unsure if this is my fault or not. Worked out well as a latte, but straight shots it wasnt as pleasing as some. I liked this coffee. It was a little lighter roast than I usually prefer, but the beans had some gloss to them, which to me is a good sign. It was not bitter or acidic. Nice and balanced but not the most interesting blend. relatively dark for a medium roast. I liked it, but it was a little light for me. Seemed a little bitter in the French Press. Tastes better from a traditional coffee pot. It's okay. Pretty mild flavor, would prefer something bolder. Bummer! I really wanted my first review to be a positive one! I brewed this coffee using a Baratza forte burr grinder and a beehouse pour over, a gooseneck kettle, purified water kept at a consistent 202 … the whole 9 yards ... and wow was it terrible. My first warning was the packaging, which did not include a roast date. That’s a bad sign. No “enjoy by” date either. I mean … even dog food has an expiration date. As I opened the bag and poured out 24 g of the oily beans, I double checked the front of the package, which still claimed to have "medium" roasted beans inside. As I watched the coffee bloom, I was hit with the aroma that at this point I all but expected. Cheap cigar and diesel exhaust. I’ve been to short track NASCAR races that smelled better than this stuff. The taste was right on par with an over-roasted trash blend. Charcoal and cigarette. Coffees like these are why some people will not go near the stuff. I shouldn’t have to brace myself for impact when I take a sip, nor should I have to add half a cows worth of cream to cut out the char and bring it back to consumable. The body was thick and oily, the acidity was non-existent, and the finish left me feeling like I had just made out with an ashtray. I promise you somewhere in Sumner, WA, there is a bunch of poorly-sourced, cheapest-you-can-find, last-years-harvest green coffee just waiting to become some Dillanos Rogue Blend by some awful roaster who just cranks it to 11 and cooks the crap out of it. Don’t waste your time or money and don’t reward them for such a lazy excuse for “authentic handcrafted coffee”. It seemed rather bland to us. We added more than our usual amount to brewing the next day, and it had a little more flavor. I detected no caramel or chocolate notes. I like a bold coffee, but not as acidic as the Starbuck's Dark French Roast. Hope that helps. I love the earthy, dark notes in this coffee. I don't know what I'm talking about but I like it. i could drink this coffee all day every day! the absolute perfect blend of delicious coffee goodness! The rogue coffee was very enjoyable. It was a robust yet flavorful brew of various blends that created a undeniable terrific taste. The coffee was excellent for the morning rush and could also be enjoyed as a night cap after dinner with a desert. The balance of caramel and chocolate notes although traceable were not as overwhelming as first anticipated. Another oily, burnt tasting offering from Dillano's. Really hoping for some more diversity here. I really love this coffee. It's not bitter and very smooth with a nice finish that lasts long after you swallow. I really notice - and enjoy - the chocolate aftertaste. I didn't like this coffee at all. Dillanos tends to roast darker to the point where it all just tastes burnt to me. Good balanced medium roast that some of my family members really enjoyed, but personally I prefer something a bit lighter. Good blend with a little too much going on. Never seemed to get the same cup twice. Never a bad cup, but hard to replicate a particular taste. Not bad, but lacks body and roundness -- all of the flavor is in the front. Definitely a hit in this house! Another fine example from the roasters of the Northwest! Very balanced flavor. Everyone in my household enjoyed it. Great coffee. Really love the flavor on this one. Some sort of burnt flavor really put me off this one. Not the worst I've ever had, but not something I want to have too often. A good coffee for breakfast. It delivers on it notes of sweetness, but would like it a little bit darker sense I drink coffee black most of the time. Maybe the best coffee I've tasted. Rich, mellow flavor with a smooth finish.